For information about how your group can hold a food drive, contact Michelle Bertrand at 774-757-7888. If school is canceled in the Quabbin Regional School District on a scheduled distribution day due to bad weather, distribution will be postponed until the following day. If school is called off for multiple days, distribution will take place on the first day the Quabbin District reopens. We have been in touch with ElderBus about helping clients who live at Grandview Terrace who can pick up their own groceries but need transportation to do so. ElderBus clients sign up for their rides on the Monday of distribution week. The agency will pick up Grandview Terrace clients, bring them to the Food Pantry and wait for them to pick up their groceries. We will call the agency, pre-make bags for our clients to minimize the waiting time for the bus, help them shop and load their groceries onto the bus. We deliver food to those who are unable to leave their homes or who live in locations other than Grandview Terrace. 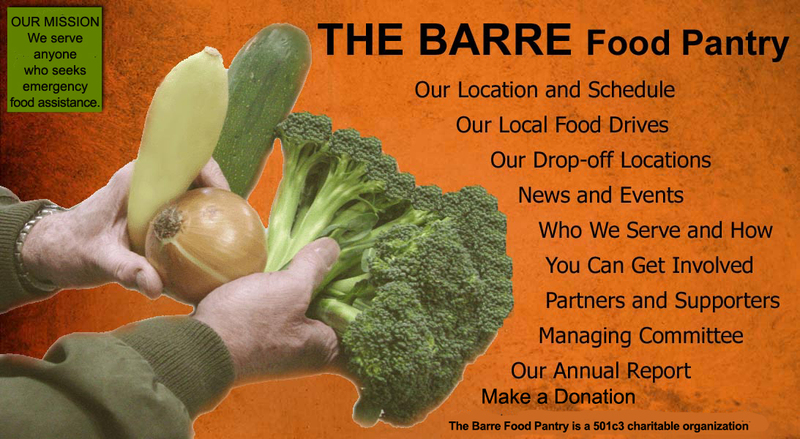 The Barre Food Pantry, its volunteers and supporters help more than 125 area families each month.